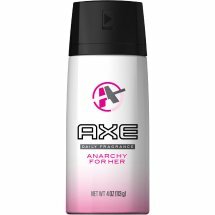 '> Whether you're looking to add a little spark or unleash the chaos, AXE Anarchy Bodyspray for Her will start the fun. This feminine fragrance combines soft florals of sandalwood, amber, and vanilla to provide you with an irresistible scent. AXE bodysprays provide deodorant protection that will keep you smelling great day and night. Sd Alcohol 40-B (Alcohol Denat), Hydrofluorocarbon 152A, Fragrance (Parfum).